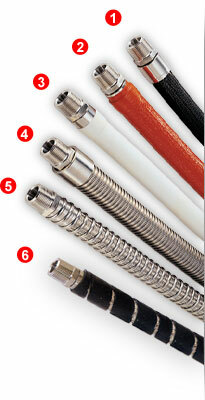 MultiFlex combines excellent flexibility with a high pressure rating. The seamless open pitch spiral PTFE convolutions facilitate cleaning because they're self-draining. MultiFlex is perfect for demanding high purity and chemical applications. Available in sizes 1/2" to 3". Corrosion Resistant - PTFE is fully resistant to the broadest range of industrial chemicals and has a zero corrosion rate with lower life cycle costs. Cleanable - Non-Stick, low porosity tube is self cleaning and does not trap bacteria and can be cleaned with steam, detergents, caustics or solvents. Sanitary – FDA- approved materials meet or exceed Pharmacopoeia class VI and 3A standards. Compatible - Will not contaminate or impart a taste, color or odor to any media. Flexible - Ultra flexible engineered design that resists cracking and stress corroding. Durable - Engineered for extended use in hostile environments involving severe chemical, thermal, and mechanical stresses. Does not suffer from aging or embrittlement like rubber even with extreme thermal cycling. PureFlex acid etches a unique serial number on every assembly 3/4" and larger. Other special tagging available. Lower Cost Then 316 S.S.